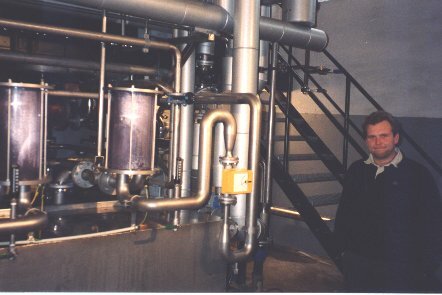 Brief introduction: Founded in 1999 by eight classmates - alumni from Royal Technichal Academy in Stockholm - this private venture has just finished the construction of the full scale distillery, replacing the small 'pilot distillery' that was on stream Dec 1999-spring 2002. 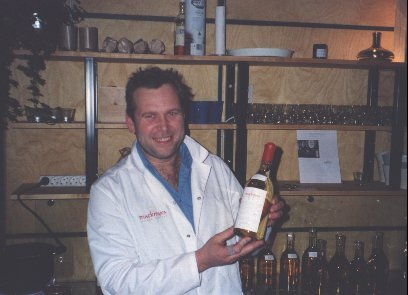 The facility is on stream since 30th of October 2002, and Mackmyra is expecting to sell commercial volumes no earlier than in the end of 2005. The new distillery is situated at the Mackmyra Bruk old facilities, in buildings that are landmark declared and therefore only a minimum of additions and reconstructions to the buildings have been done. During the days of the Pilot Distillery more than 150 different recipies were tried, with variations made in barley sorts, smoke fuel (besides peat, alderwood, juniper twigs and spruce twigs were used), yeast brands, duration in fermentation time and - of course - adjustments on the stills. The produce from this time, some 3,000 litres, is now stored in about 50 barrels in a small, cool warehouse. The barrels typically range in size from 30 to 100 litres, even if a few bigger and smaller ones, the smallest containing less than 2 litres, occur. The materials of the barrels vary too: a majority is made from fresh Swedish oak, some are remade bourbon barrels and a few are used sherry barrels. The future fate of these test whiskies is still to be determined. Some of it will certainly be used for whisky tastings on the premises, and are also a part of the "collection tastings" that Mackmyra now and then invites to in selected cities in Sweden. In just a few months the entire content of the "pilot warehouse" will be older than tree years. Barrel number one has celebrated it's fifth birthday. Mackmyra is presently distilling raw spirit from two different recipes, one peaty and one ":elegant":, as they call it. Still, nothing is available att the Systembolaget (Swedens gouvernmental ":offie":), but one can reserve private barrels in exchange for a loan to the company. Production has increased over the years. When the commercial distillery went on stream, in October 2002, some 170,000 litres of spirit was distilled per annum, but now, with nine batches a week, the production is around 300,000 litres of barreld spirit a year. A magic day was the 18th of December 2002: it was the third birthday for the oldest barrel in the warehouse, from the pilot distillery, and the 30 or so litres was officially named whisky. Pictures and comments from the tasting below! Pilot distillery: A small wooden, portable malting floor, approximatelly 2*3 metres, mobile kiln (the size of a small family caravan), small mash tun (maybe containing 400-500 litres) two washbacks; one wooden (larchwood), one stainless steel. Wash still: 500 litres. Spirit still: at first a home made of 99 litres was made, but due to the discrepancy in size between the two stills, with small batches and slow distilling as a result, the spirit still was replaced in February 2001 with a new professonally made one of 300 litres. Picture shows wash still and the newer spririt still. 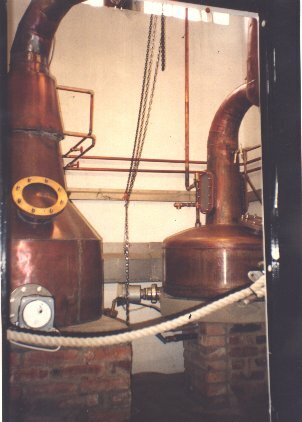 Note the water fed "cooling cuff" on the swan neck of the wash still. New distillery: One mash tun of 8000 litres, 4 stainless steel washbacks, 10,000 litres each. Batches are of 7,000 litres each, yeasting goes on for 3 days and gives a mash of 5-6% alcohol. 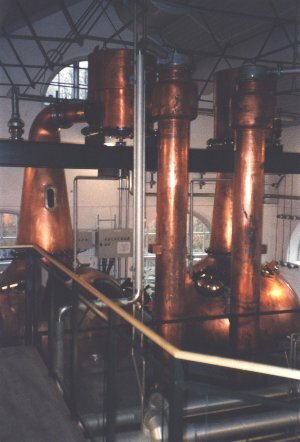 Wash still: 8000 litres, spirit still: 6000 litres, both made by Forsyths in Scotland. Note the large waterfed purifiers on the relativly short lyne arm. A malting floor, as well as a kiln, is planned adjacent to the distillery building. The (dunnage) warehouse, capacity approx. 1,500,000 litres, that was planned in an adjacent stable has not been a reality, probably due to legal problems. The main warehouse is now in an old mine. A much smaller warehouse is in the tiny island of Stora Fjäderholmen in Stockholm's inner archipelago. Picture: The new stills on stream in the same room as the Pilot Distillery. It now finally resembles what one is used to see in Scotland! valves for separating low wines and faints from the heart. A proud Production Manager Jonas Berg have good reason to look satisfied. The remaining 20% or so are sold publicly to about 1000 private shareholders. A very first: December 18, 2002 At 6 pm on December 18th 2002 one of the most important events in the history of Mackmyra Distillery and Swedish whisky took place. The first produce from the pilot distillery celebrated it's third birthday, and there was officially Mackmyra Whisky in existance, albeit only 30 litres. At a closed ceremony the first 30 bottles was filled and the content tasted. 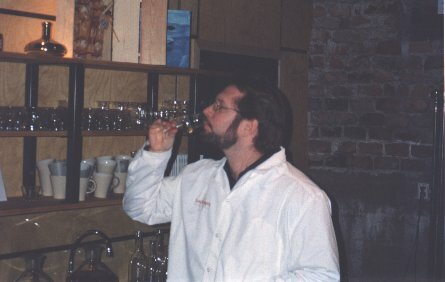 Thanks to unmeasurable benevolence, I, Christofer Psilander, was allowed to take part, take pictures and taste the whisky. I can report that it was one of the most exceptional whiskies I have ever tasted. Having tasted several of their recepies at testings on the premises, I could conclude that this first 'real' whisky had the typical Mackmyra taste, an interesting combination of complexity and smoothness, and a long, satisfying aftertaste that hung on for a good half hour after the tasting. Even if this whisky is a one-off, not only from the pilot distillery, but also from a recipe that will not be used, there is no question that Mackmyra is on the right track. I look forward to their commercial release with raised expectation as well as with great confidence.